The most popular form of outdoor activity in the 1880s and 90s was bicycling. Both men and women were encouraged to cycle for exercise and enjoyment and there were many different styles and designs of bike available, some more practical than others. 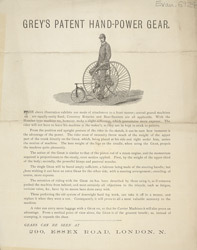 This is an advertisement for Grey’s hand powered gear and features a man riding a tricycle. Tricycles were popular with professional men who found it easier to carry bags and equipment on the 3 wheeled frames. Women were encouraged to ride tricycles as they were more stable and easier for them to use because their long skirts did not get in the way of the wheels.